The genesig easy DNA/RNA extraction protocol begins with a simple lysis step where cells and tissue are lysed to release their nucleic acid. Then minute magnetic particles are added to bind to DNA/RNA. When placed on to the genesig magnetic separator the particles are pulled to the side of the tube making it easy to remove the unwanted supernatant with a pipette. Then a series of simple wash steps are performed before the DNA/RNA is washed off the beads back in to solution, ready for analysis by real-time PCR. Its fast, and incredibly easy to perform. The key equipment you require is a magnetic separation rack. The genesig magnetic separation rack is available as a stand alone product or as part of our Lab-in-a-box here. If you already have a good quality magnetic separation rack it will do the job fine . Other than that basic laboratory equipment such as pipettes and tips is all you need. No need for any centrifuge or other capital equipment. What sample materials can I use? The genesig Easy DNA/RNA extraction kit is designed to work with virtually any sample type. The lysis buffer is powerful enough to rupture nearly all cells and viruses and the inclusion of Proteinase K breaks down connective tissues allowing maximum levels of lysis. Because there are no spin columns, membranes or filters many of the problems associated with difficult samples such as whole blood, milk, faeces, tissue etc that cause "clogging" of other systems are solved. If you have a samples type that you are unsure of we suggest you test the kit. What kind of yield of DNA/RNA can I expect? The genesig Easy DNA/RNA extraction kit gives high yields of both DNA and RNA. You can expect a yield of 7.5-30µg dependent on your sample type. 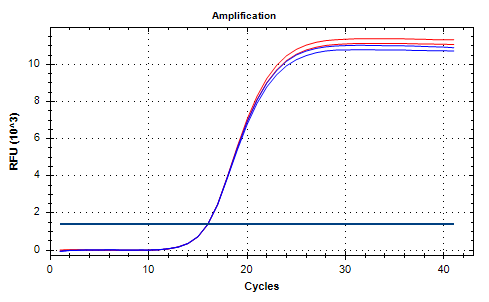 The following figure shows qPCR detection of chicken gDNA extracted from whole chicken tissue using the genesig Easy DNA/RNA extraction kit (Blue) vs. the market leading spin column extraction solution (red). This extraction kit is specially designed to extract from plant samples.